This article is about the American actor. For the Canadian musician, see Fred Stone (musician). He was particularly famous for appearing on stage opposite David C. Montgomery. They had a 22-year partnership until Montgomery's death in 1917. 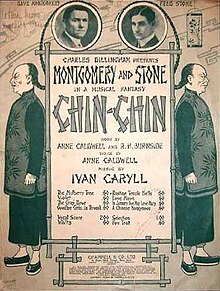 They performed in shows such as The Wizard of Oz premiering in 1902, the Victor Herbert operetta The Red Mill in 1906, and Chin Chin, A Modern Aladdin, in 1914. In 1939, he appeared in a radio program promoting the new MGM film The Wizard of Oz, in which he got to meet the actor who played the Scarecrow, Ray Bolger, who was a great admirer of Stone's work, and although Bolger was too young to have seen Stone play the Scarecrow in the stage play, he did see Stone in The Red Mill. In 1917, he appeared on Broadway in Jack O'Lantern, which, according to Vanity Fair theater critic P. G. Wodehouse "should be the greatest success he has ever had. Fred Stone is unique. In a profession where the man who can dance can’t sing and the man who can sing can’t act he stands alone as one who can do everything." Johnny Gruelle, the creator of Raggedy Ann, was a fan of Fred Stone and L. Frank Baum. Gruelle wrote a scenario for a stage show, which was never produced, in which the Scarecrow of Oz, played by Fred Stone, met Raggedy Ann. In 1923, Fred Stone and his daughter, Dorothy Stone, starred as Raggedy Andy and Raggedy Ann, respectively, in a musical extravaganza titled Stepping Stones with music by Jerome Kern and lyrics by Anne Caldwell. Stone's feature film career began in comedy westerns; his first, The Goat, was filmed in 1918. He starred in 19 feature films. In the 1935 film Alice Adams, as Mr. Adams, he was the third lead, following Katharine Hepburn and Fred McMurray. He made his home in Bayside, New York, where he was a neighbor and friend of boxing champion-turned-actor James J. Corbett. Around 1917, Stone built a small estate in the exclusive private community of Forest Hills Gardens. The excess grounds were sold off as building lots for two other homes. However, the original mansion still stands. In it are symbols of his acting career, including a theater in the basement and a separate room of store costumes. In 1926, after the death of his good friend Annie Oakley, he was given her unfinished autobiography. Stone and his wife, Allene Crater, whom he met in the company of The Wizard of Oz, had three daughters, Dorothy, Paula, and Carol. Crater also appeared, in a small part, with Stone in Jack O'Lantern. A Vanity Fair review of the play said of Crater, "My only complaint is that the structure of the entertainment makes it impossible for Allene Crater, who in the little bit she does shows herself one of the most refreshing comediennes on the musical stage, to have a really good part." As an adult, Dorothy became her father’s stage partner. In 1929, Stone was critically injured in an airplane crash attempting a stunt. In addition to many other broken bones, his legs were crushed and he was told he would never again dance. His good friend Will Rogers filled in for Fred in Three Cheers, a stage show written for Fred and his daughter, Dorothy. Rogers was a hit, and Stone worked at therapy relentlessly until he proved his doctors wrong and returned to the stage in Ripples (1930). He became ill and blind and was hospitalized on August 25, 1957, the year his wife died He died on March 6, 1959 at his home in North Hollywood, California and is buried at Forest Lawn Memorial Park (Hollywood Hills). George Ade wrote Fred Stone Jingles for Good Little Girls and Good Little Boys (20 pages, 8 poems, 10 interior photos by Charles Dillingham, George A Powers Printing Co., 1921). Stone's autobiography, Rolling Stone, was published in 1945 ( McGraw-Hill Book Company, Inc.). P. G. Wodehouse mentions him in the short story "The Aunt and the Sluggard", a Jeeves and Bertie Wooster story. ^ Wodehouse, P. G. (December 1017). "Fred Stone and a Few Others". Vanity Fair. ^ Robin Bernstein, Racial Innocence: Performing American Childhood from Slavery to Civil Rights, (New York: New York University Press, 2011), 161-168. ^ "United States". Time magazine. December 6, 1926. Retrieved 2009-04-08. From Greenville, Ohio, I received a heavy brown pasteboard box, which I carried to the stage of the Globe Theatre, Manhattan, and opened in the presence of a notary public. It contained several scrapbooks, with clippings, photographs, letters and a typed autobiography up to 1890 of my late friend, Annie Oakley Butler, ablest markswoman in history, who died last month. There was no letter of explanation but it seemed apparent that Annie Oakley, with whom I played in a circus some 20 years ago, wished me to be her Boswell. ^ "Fred Stone Ailing. Actor, 84, Unaware of Wife's Death Eleven Days Ago". New York Times. August 25, 1957. Retrieved 2009-06-30. ^ "Fred Stone, Ill And Blind, Not Told Wife Died". Chicago Tribune. August 25, 1957. Retrieved 2009-06-30. ^ Wilson, Scott. Resting Places: The Burial Sites of More Than 14,000 Famous Persons, 3d ed. : 2 (Kindle Locations 45236). McFarland & Company, Inc., Publishers. Kindle Edition. ^ Wodehouse, P. G. (April 22, 1916). "The Aunt and the Sluggard". Saturday Evening Post. Wikimedia Commons has media related to Fred Stone.